I recently uploaded my new Elementary Story Starters printable to Teachers Pay Teachers for $1. You can visit my site and purchase the printable, which is awesome to cut out, paste onto popsicle sticks, and use in the writing center for students who are having trouble thinking of writing topics!! 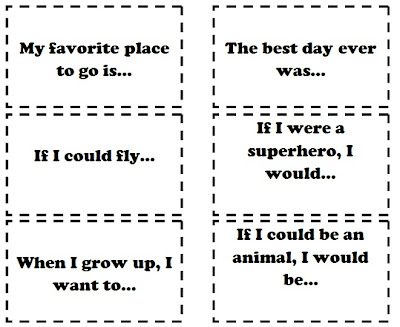 Elementary Story Starters for Writing Printable <--purchase the printable here! Here is a sample of the printable! 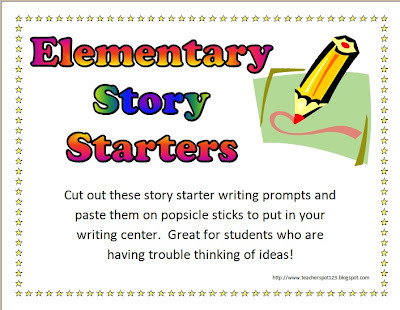 If you just want the story starters, but do not want to purchase the printable, here is a list of the 42 story starters for elementary aged students. Enjoy! That's all for now!! Please add some of your own sentence/story starters in the comments! Thanks and enjoy! I am most thankful for these "Elementary Story Starters", they are indeed useful. I have bookmarked this webpage - we don't know each other, but I'm a huge fan of your work. As a writer and food blogger, you're a tremendous inspiration. The custom essay writing service is here to help you with your writings! Wow, this blog has reminded me of my elementary schooling and the story starters helped us to master the basic communication and writing skills that have shaped us to date. Thanks for sharing this information with us and I am looking forward to reading both new and old articles posted on this site. Check our professional editing site by clicking on Paper Redoing Assistance. There are many ways in which we can derive our joy and one of them is by being the best we can be. This can be achieved by the fact the most things which happen in our lives depends on our attitude to it. In this regard, there is always an opportunity for us to be the best of ourselves. 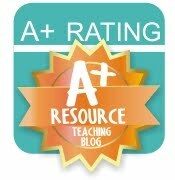 Professional Discussion Board Posts Writing service is now available online. Printable Center Cards and Schedule Cards!